If you provide care to someone living with Alzheimer’s disease, the holiday season means increasing your level of care to reduce as much of the stress and confusion as possible. With new decorations going up and family members coming over, Alzheimer’s patients often become very agitated and stressed, making the holidays a bittersweet time for your family. With a little planning ahead of time, you can make the holiday season joyful and merry for yourself and your loved ones. 1. Don’t rush the planning phase. Give yourself plenty of time to organize and plan the event. Discuss your holiday plans with your relatives to keep them informed of what’s to come. 2. Take on a new attitude. Take control of the holiday gathering with a positive attitude. Let everyone know that you’re in charge, set limits and involve everyone in the activities. 3. Discuss the situation with family members and friends. Prepare your family members for the holiday by giving them an honest assessment of your loved one’s condition. It increases their awareness and improves their communication with someone who has dementia. 4. Prepare your loved one for the upcoming event. Changes in the environment can make someone with Alzheimer’s disease very stressed. Dedicate a quiet room with familiar surroundings for the person to overcome any confusion or anxiety. A person with dementia does not always make the best decisions. Therefore, prohibit alcohol in the home, and assign someone to keep a careful eye on your loved one to ensure safety and comfort. 6. Plan the gifts ahead of time. Persuade family members and friends to give practical gifts such as medical alert bracelets. You can also involve the person with Alzheimer’s in giving gifts. 7. Communicate clearly and calmly. During hectic family gatherings, it can become loud and chaotic with so many people talking and walking in the room. Speak clearly and calmly to the person with Alzheimer’s. Stay relaxed during the situation, and remain patient and supportive. With the holiday season upon us, it’s important to take a step back and plan ahead before rushing into reunions with friends and family. 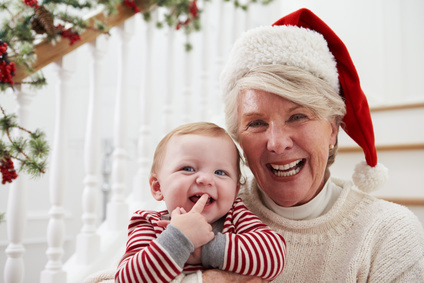 Preparing your loved one for a gathering and communicating the difficulties with friends and family can make all the difference in the world and provide a more joyous holiday for everyone involved.